Want to feel like you're dining in the Mediterranean without leaving your home? Made from a poly-linen blend, this lovely Toscana tunner brings an Italian feel to your tabletop. It's your job to provide delicious cuisines to match the greatness of this delightful tapestry. The fabric and style gives off an old world charm, and can be used daily or for entertaining. Drapes beautifully, and brings a traditional atmosphere to your tablescape, and it also works with an array of décor. Dimensions 120.0 In. X 16.0 In. X 1.0 In. I absolutely love the look and feel of this linen blend table runner. It is exactly as described and exactly what I wanted. Very happy with this purchase. 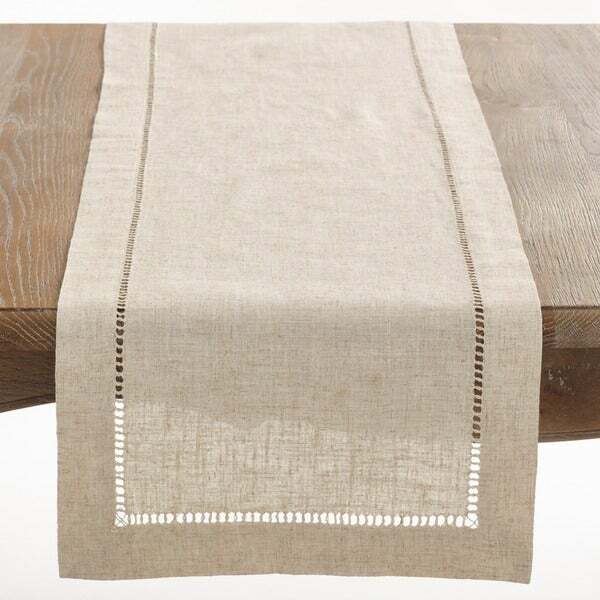 I would definitely recommend the Linen Blend Table Runner to a friend. I purchased the 16"x 72". It is exactly what I expected. It's beautiful and goes very well with my Pub Table and bar stools. The Table Runner matches the linen material on the bar stools perfectly. I took it out of the packaging and put it on my table. I did not need to press it. The wrinkles (very little wrinkles) fell out. I love it!!! Great table runner. The linen blend fabric is perfect for a refined, yet casual, look. Looks perfect on a dining room table and also great on a kitchen table. The natural color makes it easy to blend with most any color room and decor. Easy to care for. Works great all year long! Best find! Most runners are the same standard size but I love how this one comes in different sizes. Works well when I extend my dinning room table and works perfectly all year long for any holiday/season. Washes well which is an added bonus! The runner, even after ironing, lays like ribbon candy. 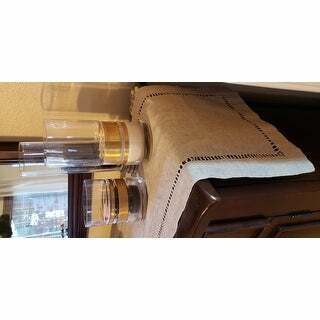 This table runner had the crisp linen feel and look I was searching for. I am very happy with purchase. Is exactly what I was looking for. Looks very nice on my long table. Beautiful runner made of quality material and craftsmanship. Slightly more of a golden tone to the natural color which works out well for me. The length was perfect for my 102" table. Had a wine spill the second day it wa son the table and with a little help from windex it completely came out, washed well and ironed back to original condition. Definitely recommend, especially for the great price for this length. Actually using this runner on the long dresser in the bedroom and so very happy with it! It fulfilled all expectations! I searched for AGES for a runner long enough for our large dinning room table and was ecstatic to find these measurements as well as the neutral design and coloration. It is linen so it has stood up to all the decorations and tableware I have placed on it and easy enough to iron. Great find! Love it! Material is nice and looks great. Quality was quite good. Looks exactly like the picture. Love the color and the quality of this runner. Bought it for my daughter and she loves it! Would highly recommend this item! Exactly as advertised and could use a little steaming or ironing. Beautiful linen runner. It's very soft to the touch and perfect for any home decor style. I purchased 2, 1 for the kitchen table and the other for the buffet. I love that the runners are simple and neutral. I was able to was by had and line dry after a piece of cake stained it. It washed nicely but was a little wrinkled. Nothing a warm iron didn't fix. Nice but a little flimsy. I have a large table and it just didn't seem to have enough substance to work with the wood. However, I use it and with the table set it does a nice job. Clean, neat...works when you need a runner for a light setting. "Why does the product description say it has a "black and white border pattern"? Isn't it all natural? I don't see black,and white." 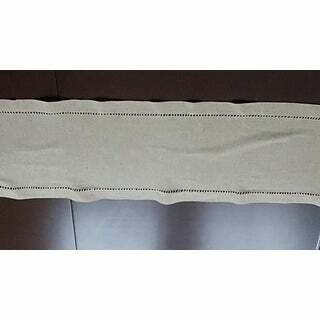 The one I received doesn't have a black and white border, it's the linen color shown in the photo. My runner is exactly like the picture shows. All neutral color. No other colors Very happy w mine! Color and style perfect for my room decor. Loved it! Simple design, great neutral color, with no fofo stuff on it.